WHO’s Africa Nutrition Report highlights an increase in malnutrition in Africa. Critical gaps in data also a concern. Abidjan, 16 November, 2017 - A newly released nutrition report by the World Health Organization (WHO) Regional Office for Africa has revealed that undernutrition is still persistent in the region and the number of stunted children has increased. The Africa Nutrition Report, launched today in Abidjan, Ivory Coast also indicates that a growing number of children under five years old are overweight. The Report describes the current status in relation to six global nutrition targets that member states have committed to achieve by 2025, and underscores findings from the recently released Global Nutrition Report. The nutrition targets call for a 40 percent reduction in the number of children under-five who are stunted, 50 percent reduction of anaemia in women of reproductive age, 30 percent reduction in low birth weight, no increase in childhood overweight, increasing the rate of exclusive breastfeeding to at least 50 percent and reducing wasting to less than 5 percent. The Report, the first of its kind by WHO in the African region uses data from national surveys of forty-seven countries dating as far back as 2000, as well as joint malnutrition estimates published annually by UNICEF, WHO and the World Bank. It raises the alarm on critical gaps in the nutrition data available across the countries. For 19 out of the 47 countries, the ‘current’ nutrition data reflects the situation in 2012 or earlier. In two countries, the most recent surveys pre-date 2000. According to the WHO Regional Director for Africa Dr Matshidiso Moeti, “The numbers and trends highlighted in the report show that we need to work harder to avoid the long-term consequences of malnutrition and poor health on our children’s future prosperity, including the increased risk of diet-related noncommunicable diseases such as diabetes and hypertension.” She added that the Report underscores the need to work harder on collecting and using accurate data given that nutrition information available for most countries is more than five years old, and the use of routine data for nutrition monitoring is extremely limited. The Report points out that while the prevalence of stunting decreased between 2000 and 2016, the absolute numbers of stunted children are in fact increasing: from 50.4 million in 2000 to 58.5 million in 2016. Stunting, or impaired growth and development happens when children experience poor nutrition, disease and lack of psychosocial stimulation. It typically occurs before a child reaches the age of two, and the long-term consequences include poor school performance, low adult wages, lost productivity and increased risk of nutrition-related chronic diseases in adults. Lead author of the Report, Dr. Adelheid Onyango, who is WHO Africa’s Adviser for Nutrition, says while overweight rates in children might still be low, the proportion and numbers are increasing in all age groups. Among adults for example, overweight, including obesity, affects about one in three women, with rates of over 40 percent in Gabon, Ghana and Lesotho. According to Dr Felicitas Zawaira, Director of WHO-AFRO’s Family and Reproductive Health, Malnutrition, beyond its obvious physical and development impacts also harms economic growth: worldwide, between 3 to 16 percent of GDP is lost annually due to stunting alone. Wasting, or low-weight compared to the height of a child, is a strong predictor of mortality among children under five. The Report finds that many countries in the African region still have wasting rates above the target of 5 percent or below, and persistent famine, flooding, and civil crises in some countries pose enduring challenges to meeting the target. Only 17 countries have so-called “acceptable” levels of wasting, below 5 percent, while 19 have poor prevalence (5 to 9 percent). 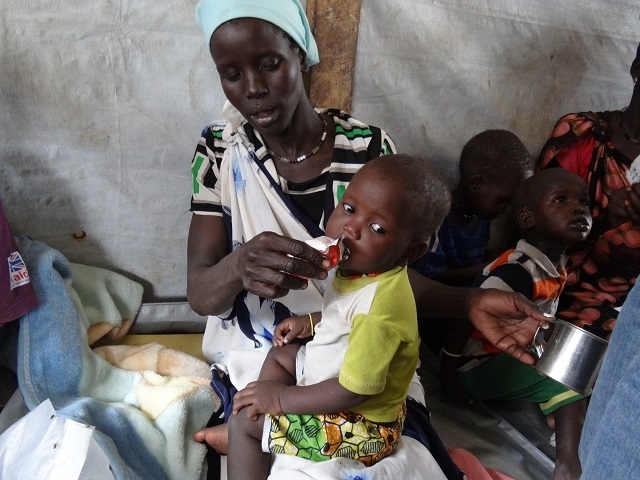 Six countries have rates between 10 to 14 percent, representing a serious public health emergency, and three countries exceed the 15 percent critical public health emergency threshold (Eritrea 15.3 percent, Niger 18.7 percent, and South Sudan 22.7 percent). Joint UNICEF, WHO and World Bank 2016 estimates show that the number of overweight children in Africa increased by more than 50 percent between 2000 and 2015. The Report found that 24 countries have rates between 3 and 10 percent; above this range are Algeria (12.4 percent), Botswana (11.2 percent), Comoros (10.9 percent), Seychelles (10.2 percent), and South Africa (10.9 percent). “African Governments can, and should, take measures to prevent and reduce undernutrition by creating favourable environments for improved infant and young child feeding, improved water supplies and sanitation, and offering healthier foods in schools among other measures,” said Dr Francesco Branca, Director of the Nutrition Department at the WHO Headquarters in Geneva. Dr Branca emphasized the need to reduce consumption of refined carbohydrates and foods high in sugars and fat, which can be achieved by making sugary drinks less affordable and less appealing through taxation, labelling, and changing marketing practices. For more on the Report click here.